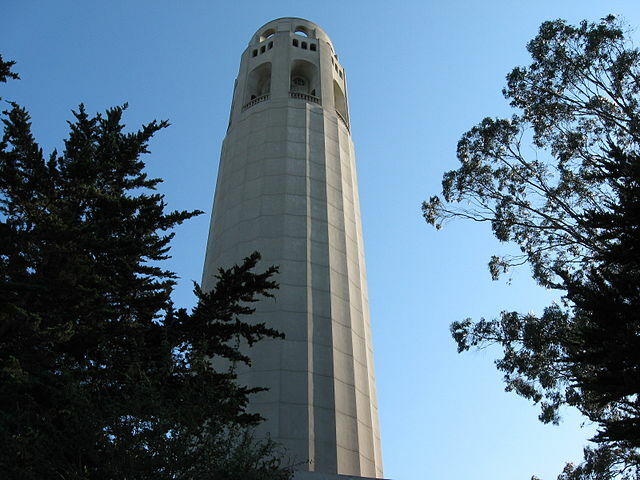 Coit Tower is located 137m above sea level - which of course is only impressive if the sea is really close by. Since this is the case this 63m high tower based on top of the 74m high Telegraph Hill, rising straight up from San Francisco's piers, provides very beautiful panoramic views. Lillie Hitchcock Coit, a rich and eccentric lady had a fondness for fire fighters. As a child she was the mascot of the number 5 fire truck crew and until the end of her days she was an honorary member of the fire brigade wearing their badge. The only difference: Lady Coit's badge was decorated with diamonds. When she died in 1929 she left behind $100,000 for the construction of this tower in honor of all fire fighters. Some of the wall paintings which can be seen inside the tower are in surprising contrast to Lillie Hitchcock Coit's wealth. They were painted in 1933/34 in a period of 6 months and illustrate the poverty and radical political position of the left-wingers of those days, depicting purest proletarian realism, created by around 30 painters who were strongly influenced by Mexican artist Diego Rivera. The pillar like shape of the tower, however, only by coincident reminds of a fire hose. An elevator takes you up to the observation deck. Je n'ai pas pu accéder à l'intérieur de la tour, mais le trajet et la vue au pied de celle-ci est magnifique. Belle vue sur la baie, alcatraz, golden gate, lombard street, La tour en elle même ne présente pas un grand intérêt mais l'accès très arboré par les escaliers - 300 marches -permet d'admirer des maisons, contruitent en grande partie en bois, semblant accrochées à la colline et qui possèdent pour la plupart des jardins. La sensation de se retrouver hors de la ville est très présente tout au long de la montée et fait oublier la fatigue. A faire.